A car bomb on Tuesday rocked central Damascus, a day after nearly 60 were killed across Syria despite a hard-won ceasefire and the upcoming deployment of 300 UN peace monitors. Three people were wounded when the blast went off in the Marjeh district of the capital, Syrian state television reported, blaming “terrorists”, the government term for rebels. “An armed terrorist group detonated the car bomb near the Yelbugha complex in Marjeh, wounding three people and causing damage to nearby buildings,” it said. State news agency SANA said the bomb was placed under the car of an unsuspecting man, who was among those hurt. The blast came as the Syrian Observatory for Human Rights said violence across the country killed 54 civilians and five soldiers on Monday, despite the tenuous ceasefire. Thirty-one of the civilians died in a government assault on the Arbaeen neighbourhood in the central city of Hama and 13 others, including women and children, died in a mine blast in the village of Jarjanaz, in northwestern Idlib province. Video footage posted online by activists showed a street in Arbaeen with large pools of blood and women weeping. Two young girls were shown in one video crying and holding up the picture of a man. “This is my father,” cries one girl. The violence occurred despite the April 12 ceasefire, and the presence of an advance team of UN monitors to implement the truce. The Observatory said clashes also took place Tuesday in two suburbs of Damascus and gunfire was reported the town of Bosra al-Sham, in southern Daraa province. The persistent bloodshed 12 days into the ceasefire has sparked growing criticism from opposition activists of the fledgling UN mission, which now numbers just 11 observers out of a planned initial deployment of 30. Neeraj Singh, a spokesman for the advance team, said the observers would be visiting different unspecified locations on Tuesday. The monitors have toured several protest hubs since their arrival in the country earlier this month, including the battered city of Homs, where two of them set up base at the weekend. During their visits, they have been greeted by thousands of protesters demanding the ouster of President Bashar al-Assad’s regime and the arming of the rebel Free Syrian Army. Despite scepticism over the UN mission, UN chief Ban Ki-moon on Monday gave the go-ahead for the deployment of 300 ceasefire monitors from next week. Ban insisted that the Assad government ensure the protection of the unarmed observers and allow them to travel freely throughout the country. 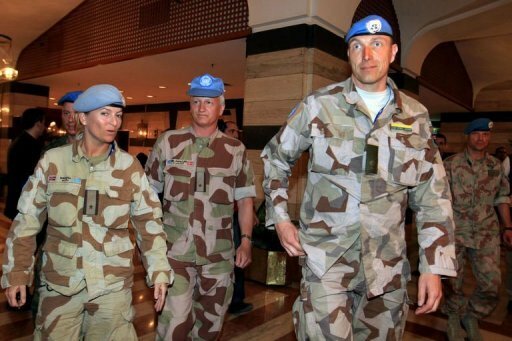 Russia, a staunch ally of the Damascus regime, warned both sides to the conflict against disrupting the work of the UN observers which it said was crucial to providing an unbiased picture on the ground. “The more observers there are, the more information we get that is based on objective facts and that is free from speculation,” Foreign Minister Sergei Lavrov said. Critics have said the UN mission was simply allowing the regime to buy time as it presses its crackdown against what began as a popular revolt but has turned into an insurgency. Washington has also expressed reservations, warning it may not back the mission’s renewal after 90 days. On Monday, US President Barack Obama ordered new sanctions on Syria and Iran and the “digital guns for hire” who help them oppress their people with surveillance software and monitoring technology. Obama announced additions to the pile of US sanctions already faced by the two governments as part of a wider effort to crack down on human rights abuses, atrocities and genocide. The measures will hit the two governments but also companies that help create systems that track or monitor their people for killing, torture or other abuses and prevent individuals involved from entering the United States.